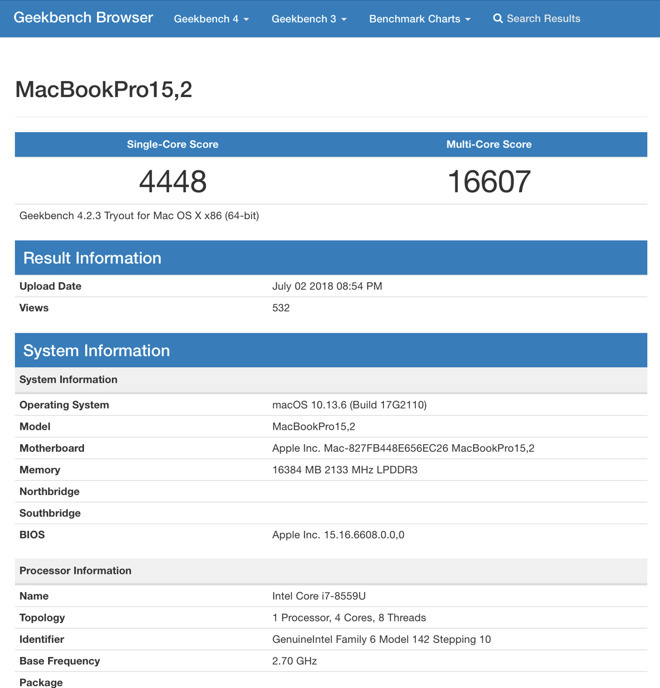 A Geekbench entry logged on Monday appears to reveal an as-yet-unreleased "MacBook Pro 15,2" model with an Intel Core iT-8559U Coffee Lake processor. It should be noted that Geekbench data can be easily spoofed, and AppleInsider was unable to confirm the validity of the log entry. As such, the following is offered for purposes of discussion. The quad-core Intel chip is capable of running up to 28W and boasts a 2.7GHz base frequency capable of peaking at 4.5GHz under turbo conditions. Apple has yet to integrate Coffee Lake CPUs in its laptop line, though the machines are due for a refresh. The benchmarked Mac runs 16GB of 2133 MHz LPDDR3 RAM, a memory type currently used in the existing line of portable Macs. This suggests users will have to wait for machine capable of addressing 32GB of RAM. Apple currently limits RAM allotments to 16GB in an effort to maximize battery life, but rumors over the past few months hinted at a MacBook supporting LPDDR4 memory. The low power protocol would allow Apple to integrate up to 32GB of RAM without sacrificing efficiency. 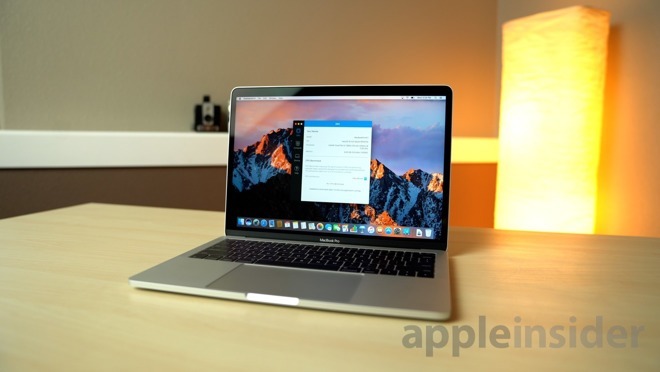 We can glean from the included model identifier — MacBookPro15,2 — that this could be an updated version of the 13-inch MacBook Pro. Compared to the current 2017 model, the new scores are quite a bit higher. The 2017 version earned around 4600 and 9500 on the single-core and multi-core Geekbench tests, respectively. The new scores, 4448 and 16607, show quite the jump in performance, if they are in fact legitimate. The Mac that ran the Geekbench test was running macOS 10.13.6 with build number 17G2110, a version of macOS High Sierra — not Mojave — similar to the developer beta that was seeded yesterday. A Mac refresh has been expected for some time as existing hardware is getting a bit long in the tooth. Not just the MacBook line, but the Mac Mini, iMac, and Mac Pro are all also due for updates. Apple teased updates to the Mac Pro coming in 2019 with a more modular design, but beyond that has remained tight lipped on other forthcoming updates.